India vs Australia 4th Test Sydney: Kuldeep Yadav returned to the Indian Test side for the final Test at Sydney Cricket Ground and proved his value as he got among the wickets and was the pick of the Indian bowlers with a fifer in the first innings. India vs Australia 4th Test Sydney: Kuldeep Yadav returned to the Indian Test side for the final Test at Sydney Cricket Ground and proved his value as he got among the wickets and was the pick of the Indian bowlers with a fifer in the first innings. 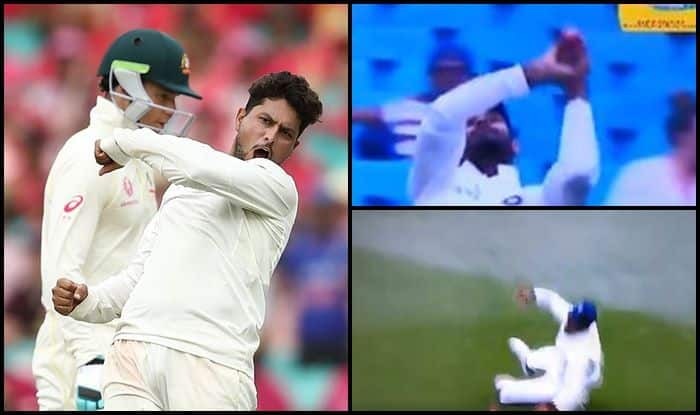 But an incident during the 93rd over nearly denied Kuldeep a five-wicket haul, when Mitchell Starc looked to hit Kuldeep out of the ground could only manage a top edge as the ball went high up in the air and Hanuma Vihari, who came under the ball and positioned himself well could not hold onto the easy chance. Kuldeep Yadav picked up a five-wicket haul as he polished off the Australians for 300 runs which meant India took a dominating 322-run lead. Kuldeep Yadav came up with figures of five for 99 runs and the second best bowlers were Shami and Jadeja, who picked up a wicket apiece. Kuldeep Yadav also becomes the first Indian bowler to take five wickets haul outside India in across all three formatsHarris was the highest run-getter for Australia as he scored 79 runs. Here is the video of the catch drop.